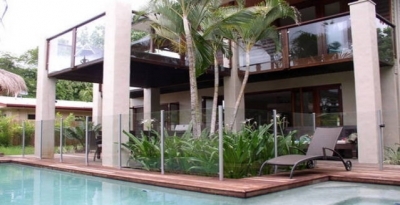 Balinese Beach House is a stunning modern Balinese style beach house situated in a lush Balinese garden setting. We invite you to listen to the waves lapping the golden sands of a tropical four-mile beach whilst enjoying the privacy that Balinese Beach House has to offer. This home sits on a quiet street and is suitable for larger groups or families requiring style and privacy very close to the beach. While boasting 5-6 air-conditioned bedrooms each with their own individual fully fitted en-suite bathroom, Balinese Beach House comfortably accommodates up to 12 people. With 2 internal living areas and separate TV room it is easy to find space to relax and enjoy tropical living. Each of the 5 bedrooms has its own private court yard or deck, where you can get some private time away from your group to read or relax. The decks are furnished with easy chairs or lounges; some with beach or pool views. Enjoy an additional large decked area, equipped with a BBQ and comfortable 12 seat dining suite, while lounging next to your own private lap pool and sensational double waterfall water feature in a luscious tropical garden. A large multi-jet spa will help you unwind and take in the breathtaking tropical surroundings. Also enjoy an extensive 2nd story sun deck with views to Black Mountain that overlooks the pool and spa with waterfall feature. For your entertainment enjoy a separate air-conditioned TV room equipped with a 52-inch plasma screen with theater sound, DVD player and free Satellite Austar TV. Centrally situated Balinese Beach House is an 80 meters walk to local restaurants, convenience shops and tavern. Macrossanst, with its world-class restaurants and other attractions, is accessible by a delightful 40-minute walk north along the coconut tree lined four mile beach. We invite you to come and experience tropical inside outside living.